the true cost of distraction – Love. Life. Practice. Over the weekend I had one of those epiphanies. One of those moments that changes your perspective on things, that makes you suddenly see the elephant in the room. Specifically, it’s the metaphor of the elephant as being the bulk of our subconscious psyche – our emotions, our habits, our desires. It’s an example used by Jonathan Haidt in his book The Happiness Hypothesis. He also posits a rider perched on top of the elephant symbolizing the conscious mind, riding this massive, powerful animal. If it were a contest of strength, the elephant obviously wins, right? The rider can’t use force to make the elephant go somewhere. The entire process of self-improvement is figuring out ways to persuade, trick, distract, or train the elephant to do what the rider wants. Enter social media. Suddenly the rider becomes just another voice in the maelstrom of sensory inputs. The poor, harried, distracted elephant suffering the slings and arrows of outrageous updates. The elephant wants to go where the rider directs, but there are just so many confusing directions possible to go, and many of them seem like innocuous detours but end up in miresome swamps of time-guzzling clickbait. But this isn’t just another “We should all focus better” post. No, this one is different. A friend of mine recently shut down his Google apps. No more Gmail, no more Drive, no more Docs. Instead he’s switching to Apple’s cloud-based apps – iCloud, etc – which offer much of the same functionality. Still, it seemed rather strange to me. When I asked him why he was doing it, he said it was because he objected to the way Google used the data of his online activities to target advertising, etc. It’s the argument that your data belongs to you, and if you’re using something for free it means that you are the product. I’m familiar with that argument, and I still use Google, mainly because I find their apps convenient. As for the data they gather on my website usage, that’s ok with me too – I’m not using it, after all. To me giving them knowledge of what kind of things I look for on Amazon, what kind of articles I like reading, even what kind of movies I love is not a big deal. However, there was one sentence in an article on Medium that changed everything. 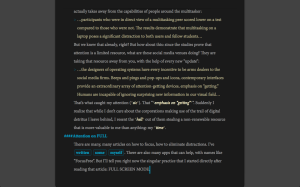 The article had the relatively unwieldy title of “Why I Just Asked My Students to Put Their Laptops Away” It’s well-worth a read, not the least to keep yourself up-to-date on some of the studies of this brave new information age. That’s what caught my attention (sic). That “emphasis on “getting””. Suddenly I realize that while I don’t care about the corporations making use of the trail of digital detritus I leave behind, I resent the hell out of them stealing a non-renewable resource that is more valuable to me than anything: my time. There are many, many articles on how to focus, how to eliminate distractions. I’ve written some myself. There are also many apps that can help, with names like “FocusFree”. 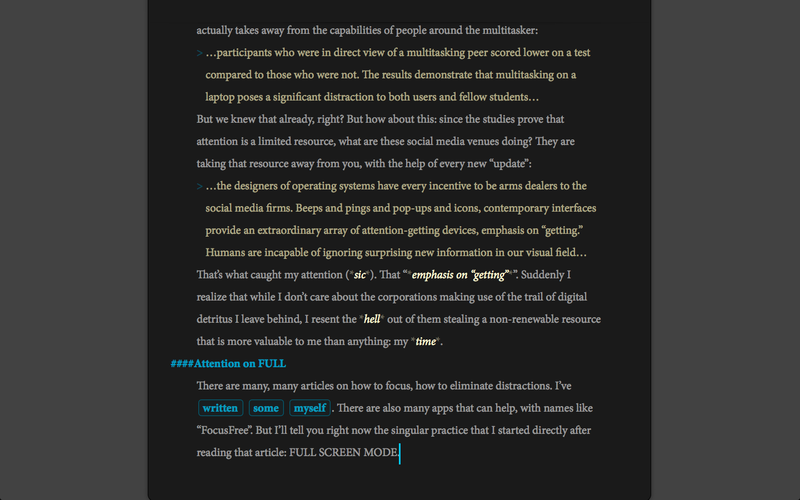 But I’ll tell you right now the singular practice that I started directly after reading that article: FULL SCREEN MODE. No more windows. If I’m in my browser, that web page is the only thing there on the screen. If I’m writing (as shown here) there’s only my wonderful Ulysses app here in front of me. I haven’t yet tracked down all the screen alerts, so it’s not perfect yet, but when I can I shut them down. Ad-free is worth the cost, and the tweets can wait until the blog post is written. It’s changed the way I work. What do you use to focus? Or what do you wish you could change?